When Stephen and Mulligan stand "looking towards the blunt cape of Bray Head that lay on the water like the snout of a sleeping whale," they cannot actually see it from the Sandycove tower. But this prominent landmark in the northern part of County Wicklow, praised as one of the glories of Ireland in Cyclops, is not very far away. It stands just beyond the prosperous seaside community of Bray where Stephen grew up, and where Molly and Bloom once took a small boat out on the waves. The fact that Bray Head cannot be seen from the Tower raises the question of whether Joyce's memory failed him when he described Stephen and Mulligan looking in that direction. But the narrative says only that they are looking "towards" the cape. In an article in JJQ 20 (1982), "Can Bray Head Be Seen from the Martello Tower?," Robert Boyle argues that Joyce probably knows what he is doing, and is representing Stephen thinking of Bray "in the mind's eye," being "drawn by memories of his mother and of the earliest shelter he could remember leaving, as he intends to leave this tower" (131). Finerty's photograph from the 1890s shows the seawall promenade that runs toward Bray Head along a 1.6 km walkable beach. 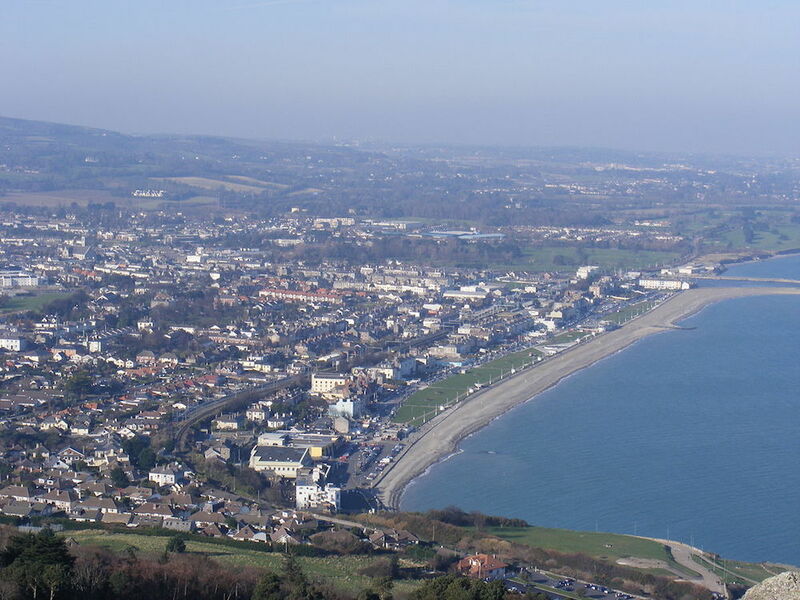 Stanislaus Joyce mentions the view of it from the Joyces' house very near the coast on Martello Terrace: "From our windows we had a long view of the Esplanade, which stretched along the sea-front half the way to Bray Head" (My Brother's Keeper, 4). 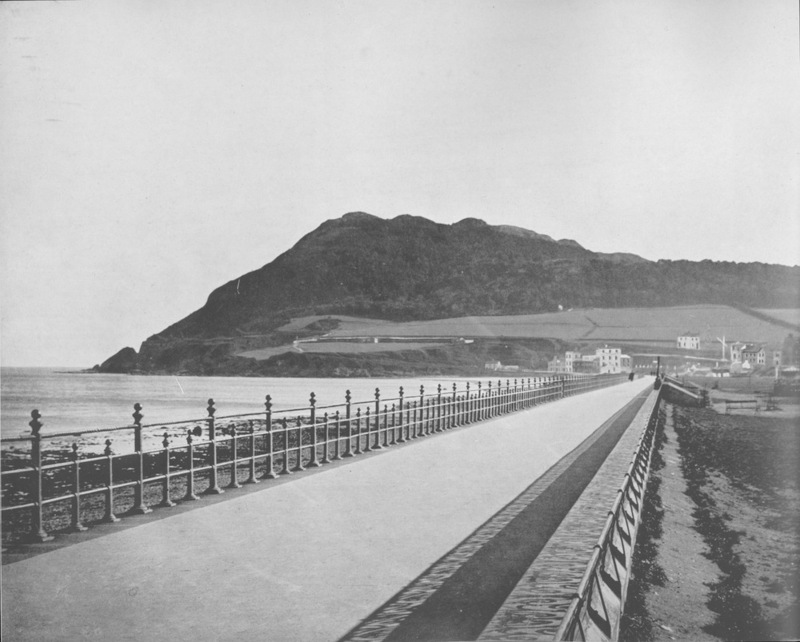 This elegant mile-long promenade was built during the Victorian era, at a time when moneyed middle-class Dubliners were moving to Bray to escape the press of city life while remaining within commuting distance. The extension of the Dublin and Kingstown Railway to the town in 1854 transformed Bray into a comfortable suburban resort destination. The Joyce family lived on Martello Terrace from 1887 to 1892, when they were still comfortably well off. The Bray home is represented in A Portrait of the Artist, in the magnificent Christmas dinner scene in which Simon Dedalus squares off against Dante O'Riordain over the tragic death of Charles Stewart Parnell. One of Joyce's memories from those days surfaces in Calypso, when Bloom mentally recites a little love poem to his daughter. In Penelope Molly recalls a nearly disastrous outing off the Bray coast: "Id never again in this life get into a boat with him after him at Bray telling the boatman he knew how to row if anyone asked could he ride the steeplechase for the gold cup hed say yes then it came on to get rough the old thing crookeding about and the weight all down my side telling me pull the right reins now pull the left and the tide all swamping in floods in through the bottom and his oar slipping out of the stirrup its a mercy we werent all drowned he can swim of course me no theres no danger whatsoever keep yourself calm in his flannel trousers Id like to have tattered them down off him before all the people and give him what that one calls flagellate till he was black and blue do him all the good in the world." Beach promenade at Bray. Source: John F. Finerty, Ireland in Pictures (1898). 2011 photograph by Patrick Comerford of the eight row houses of Martello Terrace at the north end of the Bray beach. The Joyces lived in the yellow house at the end nearest the water. Source: www.patrickcomerford.com. 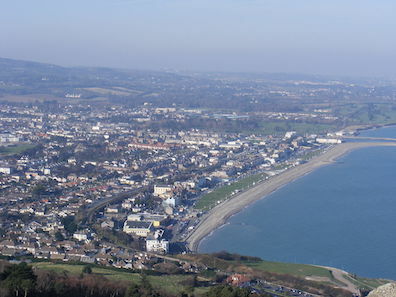 2008 photograph of the town of Bray from Bray Head, by Denzillacey. Source: Wikipedia.